I wrote a cello score for a wonderful piece, Gepetto, with Concrete Temple Theater Company back in 2010- it just keeps going! It’s played in NYC, Korea, Costa Rica, Italy, and now London! Congrats to this great company! As I entered the Canal Café Theatre performance space I was met with the scene of a puppeteer’s workshop where New York-based Temple Theatre’s tale of Geppetto: Extraordinary Extremities was about to take place. Written and directed by Renee Philippi, Geppetto is portrayed by Carlo Adinolfi, who brings the recently widowed craftsman and performer to life. 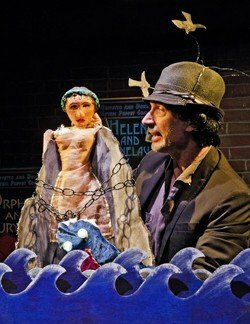 Weary after the loss of his wife and puppet handling partner in crime, the Italian sets about the daunting task of performing one of their company’s shows singlehandedly – they typically performed Greek mythological tales as a duo. Soon it becomes apparent that the puppeteer is struggling to play all the male parts and all the female parts while also attempting to manipulate the scenery solo. Geppetto improvises with props and plot changes to deliver his now, one-man-show. From repairing a broken puppet by giving it hammers for legs to killing off characters purely so there will be one less element to deal with in the story, the audience chuckled in delight at the creative decisions made by Geppetto to make the show go on. Adinolfi demonstrates Geppetto’s full spectrum of emotion, from his delight and joy as he talks to his puppets and carries out his craft, to a despairing widower when the mythological narrative runs too close to home and causes him and the audience to pause and remember he is entirely alone. Matt James, a solo cellist, accompanies the puppets’ adventures providing appropriate moments of tremolo-mediated tension. The lone instrument is an apt accompaniment for the isolated figure at the centre of this story and the, sometimes haunting, cello lines written by Lewis Flinn facilitate the shifting pace in the unfolding scenes. There were a couple of moments where it was unclear whether additional flying puppets and props were part of the intended plot but it enabled Adinolfi to further demonstrate the creativity and spontaneity of his storytelling skills. He used an impressive number of objects and much of the space to bring us into sweet Geppetto’s intimate workspace for a time and share in the hardship of returning to normality after the loss of a loved one. Concrete Temple Theatre proudly presents the UK Premiere of Geppetto: Extraordinary Extremities, written and directed by Renee Philippi, performed and designed by Carlo Adinolfi, with original music composed by Lewis Flinn (Lysistrata Jones on Broadway) performed live by UK cellist Matt James. “To Wong Foo” musical has 1st NYC reading!